Who's the picky eater? Not Matilda A little girl with adventurous tastes turns the tables on her food-fussy parents and teaches them that dinner can be more than chicken nuggets. Matilda Macaroni loves to try new foods, whether it's her grandma's jambalaya or sushi at a sleepover. 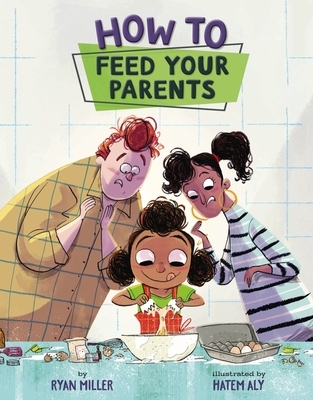 But, in this fun, twisted picture book, it's finicky mom and dad--not the child--who eat only pizza with pepperoni (delivered), burgers from a bag, or noodles from a box. Eager to experience new flavors, Matilda secretly sets out to learn how to cook, satisfy her hunger for something more . . . and expand her parents' palates, too. There's also a Macaroni family recipe for quiche that young cooks can try. Ryan Miller has worked as a columnist, reporter, newspaper editor, online marketer, blogger, and author. He lives in Northern CA with his wife, three children, dog, and small flock of egg-laying hens.Hatem Aly is an Egyptian-born illustrator who currently lives in New Brunswick, Canada, with his wife, son, and pets. He illustrated The Inquisitor's Tale by Adam Gidwitz, which won a Newbery Honor and the Sydney Taylor Book Award despite illustrations of a farting dragon, a two-headed cat, and stinky cheese.